Many large, fast-growing companies still rely on email and outdated business solutions to collaborate, spending countless hours in business meetings to ensure team alignment and communication. The result is a slow-moving, inefficient organization that cannot compete in today’s business climate. Knowledge workers are becoming more distributed all over the globe. Remote workers increasingly rely on constant connectivity, expect faster access to information, and require sound execution to maintain a competitive edge. Redbooth allows large enterprises to break down organizational silos and geographical barriers - enabling better teamwork, real-time connectivity, and true collaboration. Redbooth is used by Fortune 500 companies worldwide to keep global teams connected, in-sync and highly productive. 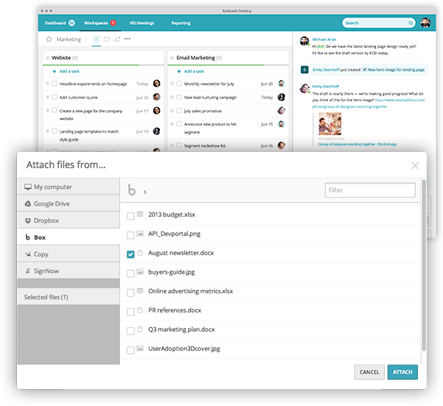 Share and manage your company’s documents with Box and Redbooth for secure and productive collaboration. 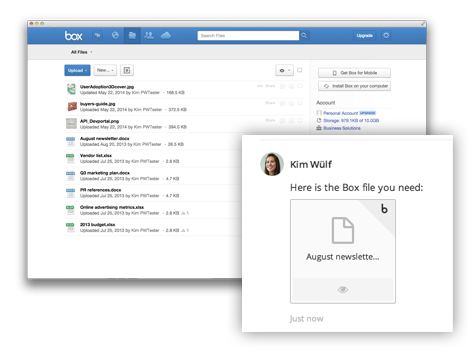 With our Box integration, you can work in Redbooth while storing and managing all your files in Box. Bring together Box’s best in class security and Redbooth’s collaborative environment. Leverage your existing investment in Sharepoint while gaining Redbooth’s agile collaboration capabilities. Easily attach Sharepoint documents and content, while communicating and collaborating inside of Redbooth. Reduce your reliance on email and take control of your inbox with our Outlook plug-in. Become more productive by turning any email into an actionable, trackable task for yourself, or anyone on your team. Enable advanced project management forecasting and resource planning with our Microsoft Project integration. Kickstart Redbooth workspaces with an existing project, or visualize and analyze performance with Microsoft Project. Get the best of online collaboration and communication while keeping the power of a traditional project management tool. 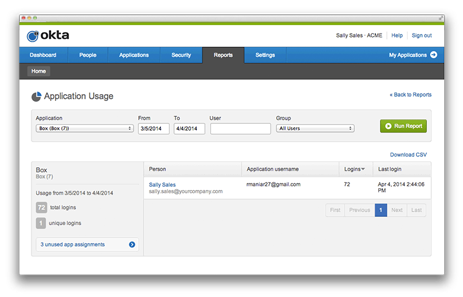 Secure access to your content transparently with SAML, Active Directory and other leading identity providers. Redbooth partners with Okta to provide a seamless experience for customers while offering enterprise-grade security, audit capabilities, and identity management. See the status of any project, initiative or task within your team or company within seconds. Eliminate unnecessary team meetings and lengthy status reports. Make your 1 to 1 meetings more effective and hold your team accountable with Redbooth progress reports. Rest easy with Redbooth’s highly secure, PCI DSS Level 1, SOC 1, 2, and 3, and ISO 27001 certified data centers. Redbooth servers and data are monitored 24x7 for up time, availability, and intrusion detection. Redbooth helps us collaborate on complex information management solutions at the University of Arizona for the Department of Medicine (and others). The addition of secure storage from Box adds another layer of security and opens the doors to using Redbooth for new types of projects across the University. We evaluated over 20 business collaboration tools including SharePoint and found Redbooth to be the most intuitive and comprehensive platform available. Redbooth goes beyond a ‘tool’ bringing together all of the business applications we use in one centralized location allowing us to get more done with better accuracy and efficiency. Working on a project with a large multinational energy company, we had to find a Web-based collaboration solution that we could host internally - Redbooth delivered just that! Systems Consultant at GeoEnergy, Inc.